Link-building is still a relevant ranking factor in the Google algorithm. However, in a post-Panda world, the focus is on quality rather than quantity. A natural backlink profile from relevant, reputable sources is ideal. But just because you have a great site or quality content does not mean you simply accept the links you earn passively and not put any active effort into a link-building campaign. Before you jump headfirst into your ongoing link-building campaign, there’s a little backtracking you should do to reclaim unlinked brand mentions. Imagine how many times in the past year your brand was mentioned on a site, but the author or webmaster did not link back to you. Now what if you could turn a fraction of these mentions into links leading to your site and drive link equity and potentially more traffic to your site? To quickly grab all mentions of your brand (linked or otherwise) during a certain time frame, do a Google search using advanced search operators, making sure to filter out your own site, social media sites, and press-release sites. Alann’s Pet Grooming can search for their specific brand name in the past year with the exception of their own site and popular social media sites. Next, export the SERP results. Tools like SEOquake are free and make this simple. If your brand is commonly written incorrectly (i.e. Alann’s Pet Grooming is often incorrectly called Alan’s Pet Grooming), redo these steps for these variations. Comb through these mentions and find those that present opportunities, such as positive brand mentions that do not link back to your site. Use Moz or similar quality standards, such as Domain Authority and Spam Score, to narrow your list down to high quality opportunities. Set a certain minimum domain authority and a maximum spam score you won’t respectively go over or under. Once you’ve culled your list down to only the best and brightest, you’re ready to move on to the next step: the beginning of the outreach process. Don’t be discouraged if you don’t hear back right away. The average business person receives over 120 emails per day. To ensure that that they see your message in the chaos of their inbox, send a minimum of two friendly follow-ups in the next couple of weeks after your initial outreach. You can track who you’ve reached out to and what follow-up you are on in your past mention backlink opportunity spreadsheet. Protip: Don’t send a request for multiple backlinks to the same site/webmaster. When you’ve got a lot of unlinked mentions from the same domain, choose the most valuable backlink opportunity to target. Links from disreputable websites tarnish your backlink profile. Moz’s Spam Score is a formula that calculates the likelihood that Google does not trust a site. Backlinks from these domains, even if you had nothing to do with them, might hurt your site. Thankfully, Google provides a process for you to “Disavow” these links. Don’t go around disavowing every site that looks moderately questionable, though: use this tool selectively and carefully. Also, remember to check if the link is a “follow” or “nofollow” link. You can do this using the MozBar or using your browser’s “inspect element” tool. If the backlink is “nofollow”, there’s no need to disavow. By disavowing links that have a high chance of being flagged by Google, you’re ready to begin your ongoing link-building strategy with a healthy link profile foundation. Now that you’ve captured as many past mentions as possible and you’ve cleaned up your backlink profile: you’re ready to embark your ongoing backlink strategy. There are quite a few link-building tactics and more than one strategy should be implemented. However, the most basic is the ongoing version of the unlinked mention strategy. You can use Google Alerts or Moz Fresh Web Explorer to set up alerts for your brand names to be sent to you on a regular basis. If you are conducting backlink outreach for the most recent unlinked mentions on a weekly basis, for example, you’ll avoid having to do massive amounts of outreach all at once. Use search operators to minimize broad, irrelevant results and not be inundated with useless notifications. Avoid acronyms unless you are by far the most popular or one of the popular brands carrying that acronym. 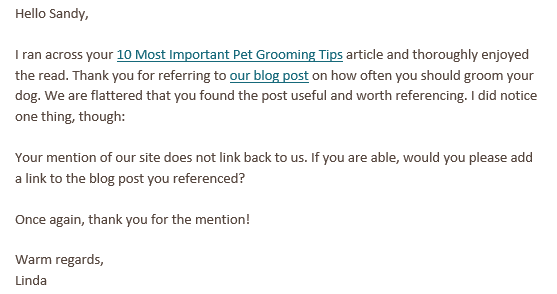 Alann’s Pet Grooming should not set an alert for APG or they will get alerts about the Association of Professional Genealogists constantly. Remember to include the same common misspellings of your brand that you did during your past mention efforts. A solid ongoing link-building strategy to supplement your creation of quality content is still a necessary aspect of Search Engine Optimization. Past and current mention strategies are a great way to get started on your backlinking efforts. Happy link-building! Need help with your off-site SEO? Ask about our Search Authority Audit and Plan (SAAP).